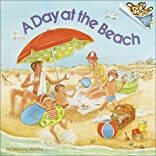 A family spends the day at the beach where they swim, build sand castles, explore the tide pools, and watch birds. About MIRCEA VASILIU (Author) : MIRCEA VASILIU is a published author and an illustrator of children's books. Published credits of MIRCEA VASILIU include A Day at the Beach, A Wrinkle in Time.